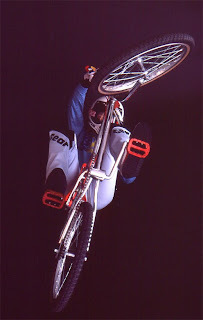 Historic BMX Photo - World's First Ramp Flip EVER! In 1984, I was living in Arizona and I would ride my Kawasaki Tecate 250 three-wheeler down by the Salt River. This is a place where every one would go to keep cool and hangout. Guys on motocross bikes, girls floating in tubes with coolers and beer. Anyway, one weekend I see this huge crowd watching some guy on a bmx bike. I ride over and see this guy is setting up plywood across the river rock and a big wood ramp. I ask whats going on and I'm told they are going to jump into the river. Cool, I race back and grab my cameras from the truck and get right down in the river. There was some great cross-ups and jumps, but this guy; Jose' Yanez comes speeding down the ramp and pulls a full flip into the water! After shooting a bunch of photos, I grab Jose and ask if he could do that ramp-to-ramp? He told me he thought so and I lined up the first ramp-to-ramp jump behind the ABA offices. Jose went on to perform at the ABA Grands and then went on tour with Barnum and Baily Circus. Today, a flip is yawn, a regular trick, but you are seeing the grandfather of flips and the first ever photographed! Woody Itson and I made our way to the highest hill we could find in Orange, Ca one night to shoot some pictures. In a parking lot high above the city lights we shot the classic Curb-Endo. The action is stopped by the flash and we still get some blurred lights from the long exposure. Who wouldn't love to have Woody's Hutch in their collection? The ramp in Austin was great on the river and made for the best photos. 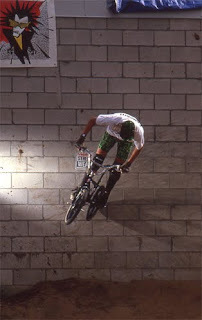 This is Dave Voelker high above the ramp at the 1988 Round 3 event for 2-Hip King of Vert. Voelker placed third in the expert category at this event, but ended his ride with a jump into the water. This was shot at the 2-Hip K.O.S. near San Diego about 1986. Wilkerson piled a bunch of dirt against the back wall of the shopping center and everyone went crazy. Every major rider from the day was at the event and in true 80's fashion Vision Street Wear made the mark and outfitted the riders. If anyone knows who this rider is I would love to identify him? I am guessing it could be Brian Blyther? 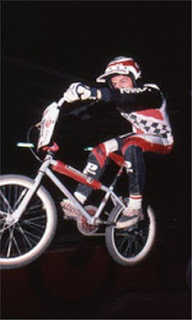 UPDATE: STRIKE at vintagebmx.com helped us identify the rider in the picture as Craig Campbell...thanks! Talk about a photo that just screams fluid style, Kirk Crisco was really competitive. Kirk rode for Steve Rink at Powerlite and always had that laid back stance over the whoops. Thanks to Shannon for the id on Kirk! 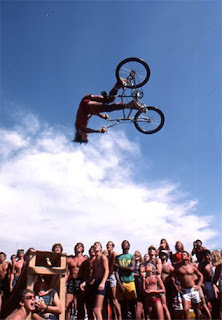 Ron Wilkerson had been promoting his 2-hip King of Vert competitions with great success in the 1980's. 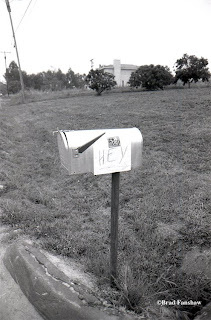 This photo was taken at one of the first 2-hip King of Street comps near Del Mar, California. Wilkerson and crew invaded a parking lot behind a grocery store. They rolled in a couple of junk cars, wood ramps and used the back of the store for wall rides. The photo is Ron stalling on the edge of a car before spinning and riding to the hood. This event was a scene! King of VERT Event Sign...How Far the Sport Has Come! 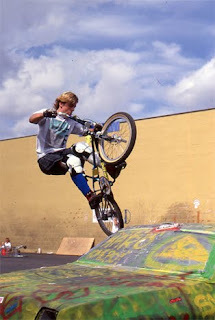 I went to so many BMX and Freestyle events in the early days and most were at rural out-of-the-way locations. BMX tracks were out in the boonies and freestyle events were only sometimes held at areas. Today, huge corporations like Mountain Dew and Gillette sponsor the events and they are held in nice stadiums and have TV coverage. Just 20 years ago events like Ron Wilkerson's 2-Hip King of Vert competitions were pretty low key. Just take a look at the event sign above and it gives you a clear ideas of how it was! 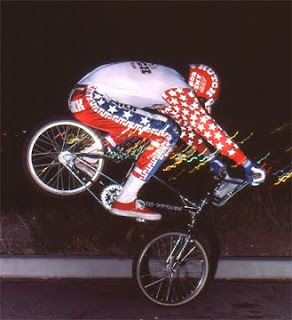 Eddie Fiola was one of the Southern California riders that emerged as a freestyle leader in the 1980's. He gained fame riding the skateparks that dotted So. Cal in the day and quickly earned a reputation as "King of the Skateparks". Fiola rode with guys like Bob Morales, Bob Haro, Fred Blood, Woody Itson and Mike Dominguez. It was guys like these that set the early trends and styles of riding. Never a big flatland rider Fiola looked at home in the sky defying gravity. 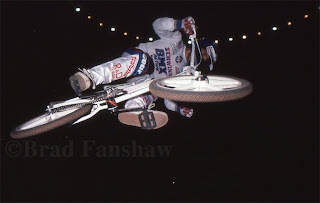 But for many the power of Bicycle Motocross Action and Go magazine that featured riders from the BMXA Trick Team made them huge stars at the time. This photo shows Ron Wilton high above the ramp with just the black sky and a ring of stadium lights. Wilton was part of the BMXA Trick team with Mike Buff and R.L. Osborn. BUY AN 8x10 Hi-RESOLUTION PRINT NOW! 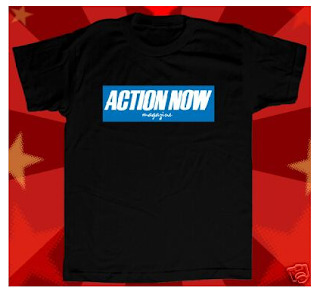 Action Now Magazine was so ahead of its time, published in the 1980's it was one of the best action sports publications ever. The reason it was so great was the talented staff of writers and photographers who sought the trends and emerging sports. Combine the sports of the day, that were just getting legs with music and culture and you have ACTION NOW! If you can get back issue of this mag grab them you will find early roots action of BMX, freestyle, skateboarding, snowboarding, rollerblade and surfing. Coverage of So.Cal music culture as well. Grab a reprint of the shirts and you will have part of the Southern California action sports culture. PURCHASE a 100% Cotton Heavy-weight T-Shirt NOW!